UPSRTC Driver Recruitment 2016 – Apply Online for 1931 Driver Posts: Looking for UPSRTC Jobs? 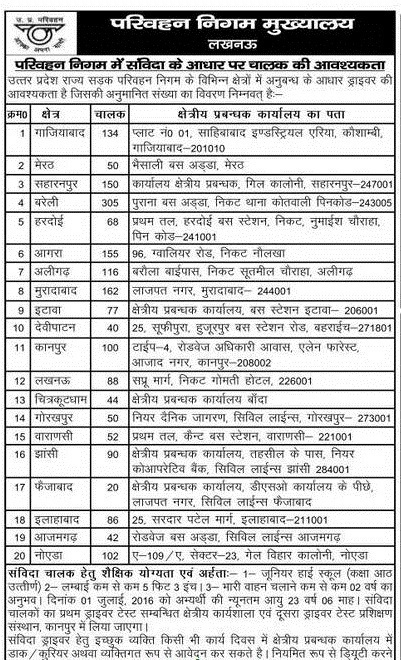 Uttar Pradesh State Road Transport Corporation (UPSRTC) Limited has announced Recruitment for Drivers posts. Online applications are invited through a recruitment notification for filling up Driver vacancies on contract basis. Age Limit: Candidates age maximum age should not exceed 40 years for Driver posts. Age relaxation is applicable and it will be calculated as on 01-07-2016. Educational Qualifications: Candidates must have passed Class 8th. Candidates minimum height of the candidate is 5ft. 3 inch. There will be two driving test for contract Base driver recruitment. The first driving test o the regional office and the second was training institute at Kanpur. Application Fee: Read notification for application fee details. Selection Process: Selections of candidates will be made on the basis of their performance in Driving test. How to Apply (Application Form): All those candidates who wish to apply for Drivers vacancies in Uttar Pradesh UPSRTC, they are required to send their application in the prescribed format along required documents to the office of the Regional Manager on or before July 2016. More Details: Candidates are strongly advised to read official recruitment notification for detailed information about UPSRTC Recruitment for Drivers vacancies of various posts with regard to age limit, educational qualifications, last date, pay scale, how to apply and online application form.